Green roofs are becoming very popular, especially with house owners who have an eye for nature and also with companies and towns that are paying more and more attention to ecological management. A green roof has many advantages and different green roof systems can be distinguished. Learn more about it in this article. A green roof is a roof provided with a certain kind of vegetation. This can be grasses, herbs, succulent plants or another kind of vegetation such as heather or dune plants. Moreover, the vegetation can be combined with solar panels or windmills. In this case, one speaks of an energy roof. Green roofs are possible on roofs that have an inclination angle from 1 to 45 degrees. If the inclination angle is higher than 35 degrees, special techniques have to be used in order for the different layers to stay in place. A drainage layer is not always required on a sloping roof since the water can drain off naturally because of the slope. We can distinguish between two types of green roofs: intensive and extensive green roofs. If you want a green roof, you can choose between two kind of green roofs: an intensive green roof or an extensive green roof. Read more about the difference between these two types below. These roofs are equipped with a garden, as usually seen on the ground floor. It can be covered with bushes, herbs, grasses and even with certain kind of trees! 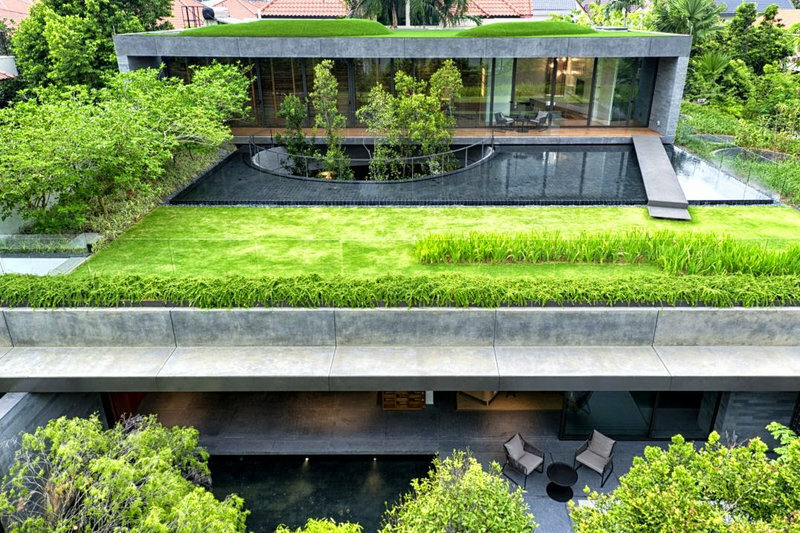 With this type of roof garden, it is obviously very important for the green roof construction to be solid enough. As it appears, a roof like this has a considerable weight (440 pounds per square metre!). An intensive green roof can be used as a normal garden, which requires much maintenance. Applicable to roofs with an inclination of 1-4 degrees. Layer thickness: greater than 20 cm. Load of the roof: 440 pounds/m². An adjusted roof construction is necessary. A license and bearing strength control by a building expert is required. Much maintenance (like a garden). ✓ Request and compare prices via our online quote service. We speak of an extensive green roof when the roof is especially covered with mosses, succulent plants and herbs that do not demand much maintenance. This roof type is not or barely walkable, but it is of much lighter weigth than an intensive green roof. The fact that this roof type is cheap, lightweight and easily feasible is advantageous as compared to an intensive green roof. Applicable to roofs with an inclination angle from 1 to 45 degrees. Layer thickness: smaller than 20 cm. Roof load: 88 to 220 pounds/m². License is not required, unlike bearing strength control by a building expert. A sedum roof is an extensive green roof provided with Sedum. These are a sort of succulent plants that can absorb a lot of moisture into their leaves. They are well protected against long-term drought and heat. Sedum can grow on special substrate or on the ground. In case of a sedum green roof, it is of great importance that attention be given to drainage (mats). The water must be able to drain off sufficiently in case of long-lasting rainfall. Furthermore, the sedum protects the roof against harmful weather conditions such as UV rays, moisture and fluctuations in temperature. Next to that, sedum has an insulating effect. 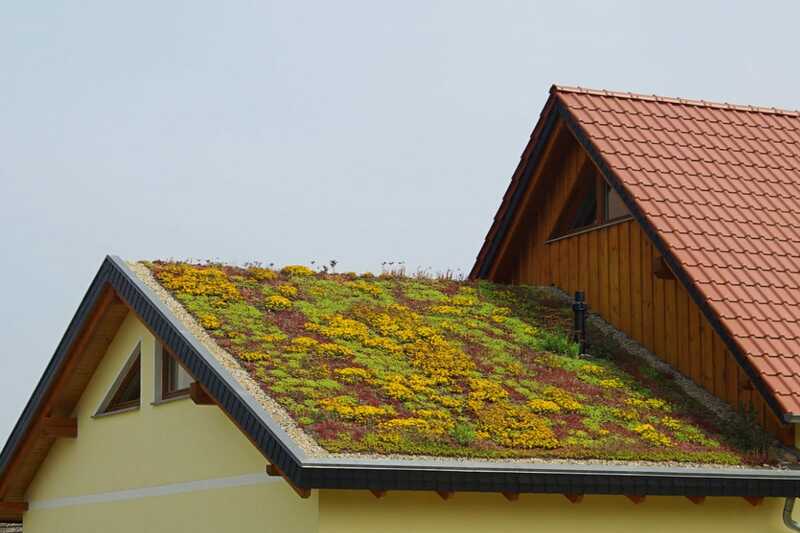 Roofs covered with sedum generally last two to three times longer than roofs with a standard roof covering. Insulating qualities: not only does a green roof insulate noise, it also keeps warmth inside or outside in winter and summer. A green roof has a natural look. The colour of the roof changes in accordance with the seasons. The life-span of the roof is at least doubled because of the vegetation’s protective effect. Green roofs contribute to the reduction of CO2 emissions. Next to that, they filter particulate matter and help to improve the quality of the air this way. Green roofs absorb rain water very well and give it off slowly. Consequently, the pressure on the sewer will be lower in case of heavy rain showers. Weed may appear on a green roof as well. This is particularly true for a garden roof, although other green roofs may have to deal with it too. Green roofs attract attention from birds and other animals that are eager to search something edible in the material. Leaks are harder to trace and fix. 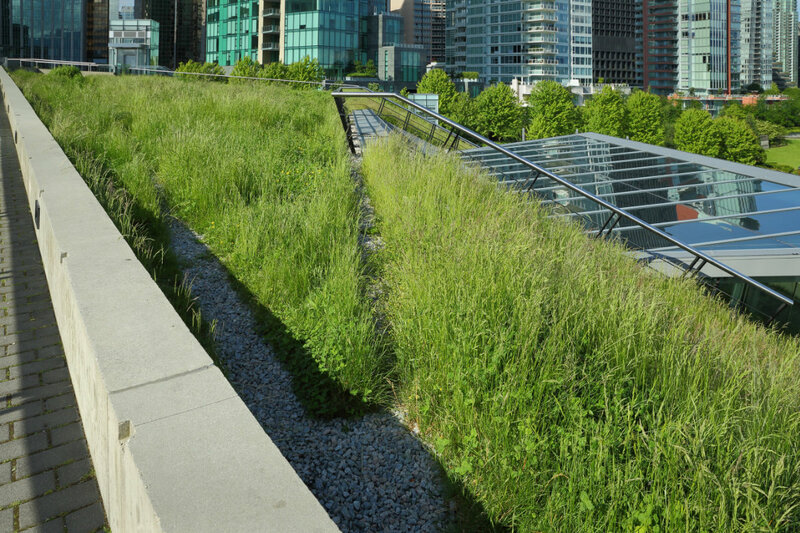 Even though it is not much, a green roof still requires maintenance. Depending on the type, considerable costs may be involved. Do you want to have a green roof installed by a specialist? Via our online offer service, you can easily request and compare prices. ✓ Click here to go to the quotation page. This system consists of a soil layer with a strong drainage function. This foundation is placed directly on top of a protective water-repellent roofing layer. The plants grow in this soil layer. The disadvantage of this system is that at a certain point, the foundation will be saturated with roots from the vegetation. Because of this, the layer could possibly lose its drainage function. The roof might get too wet or dry then, which is disastrous for the plants. In order to prevent damage to the roof, the protective layer on the roof must therefore be firm enough. This is the cheapest type of green roof. However, it is becoming less popular because of the disadvantages. With this system, an extra drainage layer is applied underneath the earth layer. This extra layer may exist of special drainage mats or strongly absorbing mineral substances such as volcanic rocks or expanded clay pebbles. Subsequently, a filter layer (filter cloth or sometimes turf) is attached on top of the drainage layer. This has to prevent little substrate particles from reaching the drainage layer and causing blockages that way. On top of the filter layer, a layer made of mineral substrate is installed. The vegetation can be put up in here. One often uses ready-made vegetation blankets (similar to carpets of grass) that are already overgrown. As the drainage is improved, this system is yet much better than the mono-layer system. 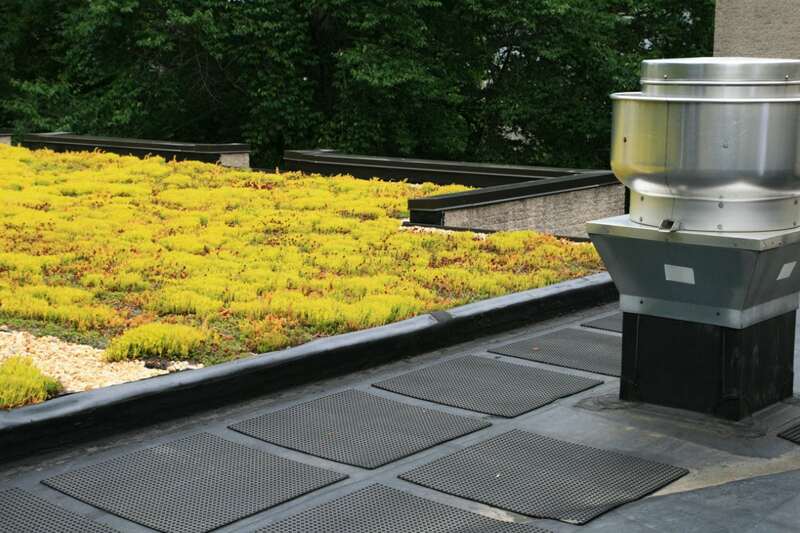 This is the most expensive, yet most sound green roof system. As for the construction, a three-layer system is identical to a double-layer system. The difference lies in the use of a rain water reservoir that is integrated into the drainage layer. During long periods of drought, the plants can still receive enough moisture thanks to the water reservoir.